New facility becomes first step to downtown revitalization. 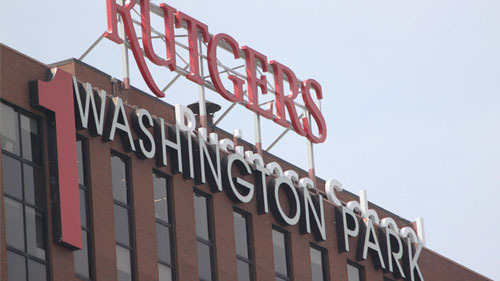 The Rutgers Business School has a new home in Downtown Newark. The project rehabilitated a vacant historic building in a district that is a priority to Newark’s plan to transform its downtown. As the first major investment in the area, the Business School has set the stage for the redevelopment of the surrounding areas. The new building has brought 4,300 Rutgers students and 200 faculty and staff members to the historic James Street neighborhood, creating a safe, attractive pedestrian area. Newark, New Jersey is one of the poorest cities in America. A quarter of its residents live in poverty, and one fifth of residents are unemployed. The city hopes that this investment will spur growth and job creation in the downtown area. Already several new businesses have opened in the area, signaling a change to come. This project will allow Rutgers to provide programs to benefit the surrounding community: the Rutgers-Newark Small Business Development Center and the Center for Urban Entrepreneurship and Economic Development train and invest in local businesses; and the Scholars Training and Enrichment Program enhances the success of minority students. As a direct lender to the Rutgers facility project, City National Bank of New Jersey was able to generate income from the loan, supporting the sustainability of the bank’s mission and operations. The bank also expanded its relationship with Rutgers University, and was able to participate in a high-impact transaction that will benefit the local community for years to come.